Tim runs a successful full service branding agency called Luminus Media and has a truckload of insight that I very much enjoyed exploring. Here are some of the points we covered. Who Tim would choose to be on his personal all-star brains-trust. How Tim broke into the industry and how he would do it now if he had to start from scratch. We cover all that and more, including Tim’s entrepreneurial debut with hand-drawn comic books in school. You can find Tim on twitter @timbouchard and you can get his ebook on the Luminus Media site luminusmedia.com/golden-mean-pricing. If you enjoy the episode or have any questions, make sure you tell us about it in the comments! PS: We has some technical difficulties part way through, Tim sounds a bit choppy but don’t worry, it clears up after a couple of minutes. 00:00 Luke Welcome to the Creating Clients podcast. Today I have Tim Bouchard on the show with me. Tim runs a successful full-service branding agency called Luminus Media, and he’s become a thought leader, particularly in the area of pricing. Today we’re fortunate enough to have him on the show, so welcome Tim. 00:18 TimB Hello Luke and podcast friends. 00:21 Luke (Laughs) Thanks so much for making the time to be with us today. But before we get into the industry questions, I’d just like to start learning a bit more about you if that’s cool. 00:34 TimB I’m from Buffalo, New York, northeastern US of A, and my background is in web design and programming. So I’m a bit of a techie at heart. I graduated from the University of Buffalo back in 2005, and since then I’ve been creating my own path in the creative/marketing industries and have — I wouldn’t say stumbled upon but gradually worked to reach this type of area where I have a small team now and a partner, a growing business, a growing client base, and it’s been fairly successful throughout the entire process. It’s fun to see and be a part of a young company, kind of up-and-coming in an older area in Buffalo. We’re kind of in a rust belt, not really depressed but [the area was] very much involved in the steel and manufacturing businesses in the industrial age in the 50’s and 60’s. So [the areas is] bouncing back from things going digital. Things like advertising and banking, and things like that are very big in Buffalo now. We’re kind of a part of that because we’re techy and we’re cool and we’re creative, so we’re having fun with that. 01:56 Luke That sounds like a really exciting place to be. So within your work or outside of your work as well, what sort of things are you passionate about? Do you have any special interests or sports, or anything that you’re into? 02:06 TimB I’m very much into the premier league. Go Blues! I’m a Chelsea fan. 2:13 TimB I race bicycles. I don’t go up the Alps but I do race fast on the flats. And I mountain bike. We have pretty good skiing and snowboarding up here in the northeast, [although] when I saw that I snowboard, I probably haven’t gotten out in the past three years because we’ve been too busy. I do still appreciate and enjoy the idea of snowboarding, so I’m into that too. 02:37 Luke It sounds like the area that you’re in, you’ve got a lot of options, which is pretty awesome. 02:42 TimB Yeah, we can see Canada from across the river too, so that’s kind of cool. 02:46 Luke That is cool. So as far as all of the great lists of things that you just gave me before, the jobs that you’ve got, the business that you have, and all the rest of it, I guess that would’ve started early? Did you have a passion for entrepreneurial things early in your life? 03:02 TimB Yeah, funny story: in junior high, 7th and 8th grade I was big into the card game Magic: The Gathering, and I was also big into comic books, and I was big into drawing. I came up with some comic book series that I would draw with Sharpie markers, make four or five pages, copy them on the copier, and color them in with markers and sell them on the school bus for like 25 cents. So that was my first entrepreneurial venture. I also made a card game that was basically a copy of Magic: The Gathering, but it was made by a little kid. I was also into music so I started two bands in high school, and I wasn’t happy with how no one was around to help out with promotion or finding shows or introducing bands to each other, so I made a record label. Very, very independent, small-scale but I brought together a few different bands to help them figure out where to record their albums, who to play shows with, and what venues to play at. 04:07 Luke Wow, that is so amazing. I really love those stories. So quick question — the comic book that you drew, did you come up with the story line, or were you getting it from somewhere else, or was it just all coming out of you? 04:21 TimB I had three. I was into anime, superheroes, and animal-detective stuff. I had one comic book called Iron Eagle, which was kind of a cross between Arch Angel and Iron Man. I made one comic book called Max, which was a detective which was an anime-style comic book that was in high school. And I had a comic book called Top Dog which was about a dog that was a detective … apparently, I was really into detectives. So those were the ones that I drew. I think I had a couple of issues of each, and I bounced around as I got bored. 04:57 Luke So obviously, as I mentioned before, you’ve had this entrepreneurial streak for a long time, but when did you start making the leap? What’s the story? How did you get into the web and branding space? 05:10 TimB I came out of school and took an entry-level job, a data entry/organization position at a survey company that worked with universities and pro sports teams to survey their students and season ticket holders. There was some light design and setting up survey templates — the pads that people would take, etc. It was digital but it wasn’t web design, and I had been doing websites ever since I started bands and ran the record label. I was getting a little bored in that sense, started looking around for actual web design positions, left the survey company, went to a web design company, and kind of worked for one person. It was just a two-man unit: me and the producer, and my boss who was basically the project manager and sales. I learned a lot about how the web and creative industry works during that year that I worked for him. I also learned a lot about how not to run a business. I was fortunate during my time in that position to be introduced to my current business partner, Mike, who is a creative. He’s an illustrator, he’s a fine artist. He was doing contract work for my first boss. And Mike, as a freelancer, was starting to get asked about web design. And it was a service that he just didn’t know how to do. He’s not a programmer. So I started helping him with websites on the side, which was completely fine with my arrangement with my boss, but [then] things started to get tense with the boss. And Mike was giving me enough side jobs that I pulled out and started freelancing. So I was fortunate enough to (1) have someone already pulling in job leads, and (2) have someone that was already producing great work to work with. And at that point, it was easy to make the first leap because I didn’t have to go through all of the initial steps of building a network and starting to get clients, and starting to have a reputation because I was able to work off of Mike’s client list and reputation. 7:23 Luke Did you guys have a name for yourself, or were you working independently at that point? 7:25 TimB At that point we worked independently. Mike had pulled me out. He was very interested in my programming skills. He was getting himself situated as a freelancer/contractor that would be able to offer more services. I was simply trying to become established as a freelancer, to make sure I could become stable enough to support myself. So we did that for two or three years. We freelanced together and then we just realized that all of the projects we were doing, we were doing together. At that point, we decided to get a DBA, a “doing business as”, which isn’t legally binding in terms of ownership of a company, but it allows you to operate under the same name. So at that point, we decided we’d give it a try for one year. We picked a name, we developed a brand for ourselves, and launched it. We were taking the income and keeping track of who was doing what, and just paying ourselves that way. After a year of successfully doing that, we set up our corporation, and kind of married each other in terms of business: we legally made it official. That was in 2010, so it’s been about six years since we did that. 8:40 Luke Congrats. So when you were working for yourself, or I guess you were working together a lot but you were still separate as far as the business was concerned. While I was doing research for this interview, I was reading how you had quite impressive growth during that time, as you led into the start of your partnership together. What was that process like? Was it very instant or was it gradual? Did you do certain things to increase that growth, or did it just all happen? 9:13 TimB I think that Mike already had a bit of a base, so we were fortunate that we had some clients that even in that two or three years needed multiple things from us. When you satisfy someone’s contractual needs or even go beyond that, they’re happy to (1) refer someone else to you, and (2) come back to you for more work. And that’s a compound number. You do that enough times and you start to double, triple, quadruple your workload. Another thing that we did, which I was primarily in charge of, just because I’m a little bit more on the business and networking side than Mike is. He’s very much a relationship and a vision person. I started doing the Chamber of Commerce events, networking events, seeing what we could do for digital marketing, updating the website and making sure we had original content coming out, and most importantly, making sure our full portfolio was online. Because in order to sell yourself, you have to have proof of work. Especially in the creative industry. Whether you’re trying to get a job in the industry, or just getting contracts signed in the industry, there has to be some proof of work. So the more quality work we did, the more representations of how we could satisfy clients’ needs on our site were there, and we’ve been fortunate enough in the eight or nine years we’ve been working together that we’ve never really had to do things like cold call sales or really intense advertising. What we’ve done is set up enough content on our site, enough examples in our portfolio, and put ourselves out there as thought leaders — yeah, the term is a little egotistical — and as people who are always trying to stay up on their craft. And telling people about it, because clients are never going to be designers. They’re never going to be programmers. But they may like to read or see something you’ve been involved with that gives the glimpse of you being at the front of your industry. Even if you’re not the leader, you’re somewhere near the front of the industry and you’re not falling behind on the times. 11:26 Luke To piggyback onto that question, this is something that I get asked, and obviously a lot of the people who listen to our podcast fall into a couple of different categories, but a lot people are just getting started on their journey toward either having an agency or running a successful freelancing business in the industry. So if you had to start all over again with no team, no contacts, no pre-existing work, what would you do to get started? 11:57 TimB I’d make sure that everything that represents me online and in person — business cards, website, social media profiles — is top notch and very informative. Because you can’t even start to do the outreach process until you have a proper foundation. There are a lot of people who like to take a shortcut, and we have enough clients that sometimes suggest this to us — that if they just had the business card, they could go out and start to get sales. In the creative industry, you have to have the proof of concept, proof of work. Start with the foundation, and then go towards the easy things. Go towards friends, family. Find out what their network is. Go to easily-attended local networking events. And take advantage of social media: LinkedIn, even Facebook, for connecting with people. Take advantage of Twitter for getting your ideas out there and starting to build this cloud of knowledge and this digital reputation that can precede you before you start to have physical conversations with people. And kind of go from there. You have to have the foundation. Without the foundation, you can’t have anything. 13:17 Luke Yeah, I guess that’s what having a strong brand is all about. That is that foundation, isn’t it? I’d like to take a step forward to your shoes today … What does a day in your life look like — a typical day these days? 13:31 TimB We’ve grown into full service. Mike and I had to hire more people with complimentary skills. We’ve gone from two, to seven people on our team and a contracted sales person. Gradually what happens is if you choose to leap into freelancing, you’re making the commitment to doing sales, administrative, and project management all on your own. Which is great. You commit to it, and you dive into it. When you decide to take the next step, partnering with someone else and hiring people, each one of those … steps slightly further away from the thing that brought you into starting a business. So my passion, my background is websites and … I love code. I love making the concepts in Photoshop turn into something that lives and breathes, and responds to devices now … and works with visitor input. I’ve fallen back into a business management role, dealing with things like HR, accounting, helping even though I’m not the point person … for sales. Just generally checking on how things are going, checking in with clients to see how the process is going so we can make them happy. And then sometimes I still do programming work. I still jump in once in a while. I’ll either back someone up if we’re overloaded or if there’s an old site that would just be quicker for me to go in and update. I can still do some programming that way. So I play that role very often, which can be fun or stressful depending on how you look at it. I’m the type of person that kind of excited by being stressed in those situations. It’s probably why I wanted to work for myself rather than just fulfill the job requirements for someone else’s company. Because I welcome those challenges, and that’s an important part of starting out too — making sure you find that as exciting and appealing as you do the core talent that you have whether it’s design, coding, writing. Because if you don’t have passion for the business side and find that exciting, you’ll come up short in the sales, in the project management, and the client-retaining aspect of the job. So I shifted over towards that side. It sounds very business-related but I still get to see lots of cool creative. I still understand code. I still go to WordPress meetups. I keep myself up to date that way, instead. 17:15 Luke I think that’s very insightful because there’s so many people that love what they do — that development or design, or whatever it may be — and so they go down the path of creating a business. And as you say, they fast find out that you can’t sustain that and run the business well. So you either need someone to do that job, or you need to be willing to step into that role. 17:36 TimB Yeah, it’s a side effect that no one really thinks about right away. It’s like a hidden tax on yourself. You just didn’t know it was coming. 17:44 Luke That’s a really good way to put it. I know when I first started moving from being the primary freelancer that was doing the jobs, to working with a partner who was doing the development for me, and that sort of thing … I thought that if I just did good enough work, then people would just come, and the business would just operate all by itself. And then I found out that that was a lie. (Laughs) So I totally understand. So if you could assemble your own personal brains trust, three to five people that could advise you over the next 10 years, who would be on that brains trust? 18:30 TimB Oh man, now I have to think of names. Well there’s … I can name some people I recently met that I really look up to, and that may even be worth name-dropping so that people can look them up on your podcast. Someone like Anthony Shop from Social Driver. He is someone that knows how to reach a variety of audiences, and gain their trust and loyalty and passion to further his clients’ objectives. They’re from DC. They work a lot with awareness campaigns, and it just amazes me the buy-in that he can get from his clients, visitors, and followers. So that’s one person I would want to help me figure out how to take my message in that direction. So that would be useful. Another person: Aaron Irizarry from Nasdaq Design in New York. I actually have him coming to Buffalo to speak in December for our advertising club. He is a project management guru. He works with a ton of designers, programmers. He coordinates and critiques the designs. He knows how to communicate between tech and creative. He knows how to translate that to upper-level management. And it’s basically magic what he does. He’s very good at describing it. What I found is I gravitate towards following people that are good at describing very complex things in very relatable ways. And then another person … let me think of a leader of sorts. I’ve got … I’m coming up blank on business. I feel like there’s someone in business that I follow that I just can’t pull out of a hat right now. 20:18 Luke That’s alright. I’m happy to leave it at two, but appreciate it. So I just want to transition now to start to talk about pricing. Obviously you’re probably best known for what you’ve written about “golden mean pricing”. So just for those who haven’t been exposed to that concept, could you explain exactly what golden mean pricing is for us? 20:40 TimB Yeah, so one of the things that any business person struggles with, whether they’re starting out on their own or they’ve had a company for a while, is finding a pricing system that adapts to where you are in your thought process, what your clients commonly expect from you when you price a project or a contract. And what I’ve done over the last seven or eight years is try a few different kinds of pricing models. And I’ve always had some success with each one. And I’ve always found some limitations with each one. But if you kind of correlate this to my comic book story, where I make a character like Iron Eagle because I really like Archangel’s wings and I really like Iron Man’s suit of armor, I found a way to incorporate three of my favorite pricing models. Which works almost to the full extent that I needed them to, but took the best parts of each one and really stepped back and looked at how I view pricing a project. And found how each one of those contributes to it, and visually laid out a way for me to understand what my thought process was. The goal of golden mean pricing is to find the perfect point in a range of pricing options that you feel comfortable giving a flat rate quote, contract, proposal, to a client, a potential client. What I always struggled with in each of the other pricing models that we can touch on in a minute, was I couldn’t find the range that I should be pricing in. I could find prices but I didn’t know if I was coming up with something that was great for me, great for the client. Is it going to cost me money? Is it going to overcharge the client? And what I really wanted to do was to come up with a way to make sure I was falling inside a range of comfortability so that I knew I was getting my due for revenue. And I knew the client was getting what they wanted from deliverables and flat rate quote. Because it’s easier for clients to look at flat rate quotes. They view project pricing from their angle, as if they were buying a product. Which is just a side effect. It’s like a cancerous side effect for our industry. Creative work, creative services are viewed still as a product-based commodity rather than a service-based commodity. So the same person that goes to a web design agency and asks for a website is expecting to view that price kind of like I used in my eBook, buying a hockey stick, where every hockey stick is the same price. You could buy 20 of them. It’s a commodity. Whereas they could go to the car dealership to get their car repaired. They’ll walk in, they’ll say what’s wrong with the car. And they’ll just hand it over and they get a price at the end, based on an hourly rate. It’s funny how people work when they view prices. But what I found in the creative industry, marketing industry, advertising industry is that people are looking for flat rate quotes. So the real challenge is what is the right flat rate? What’s the right range to be in? And what’s the right number to give them, to make sure that you’re not insulting them by going too high and having a disconnect with what their actual needs are and what their budget is. And not coming in too low because you just want the work so bad that you’re going to price it so low that you’re going to spend way too much time for the amount of money you’re getting for it. So I try to find the spot in the middle. 24:32 Luke Yeah, I think that’s a big challenge. I often get emails from our community, saying “I’m just getting started” or “this is my situation … how much should I charge for building a website for this client?” And that’s — as you would know — that’s a near-impossible question to answer because they are so many variables. But introducing a structure like you just discussed, that gives a starting point. That gives a safe range to work within. Some people have a problem with signing those types of contracts because they see a bit of an endless possibility there, with not having a max amount of time you’re spending. A lot of people combat that by using value-based pricing, where you might offer a fixed rate price. Maybe two or three options: a low option, a mid-range option, and an expensive option that adds in extra services. What I found with that one is the client will be very receptive to it. But what might end up happening is they may try and take the less expensive option that you’re presenting, and then try to work in features and deliverables from the more expensive options later on in the process. And then another way you can handle this is collaborative pricing, where you actually work with the client to say here’s my hourly rate. Here’s the five or six different types of work you want us to work on. Here’s a low range and a high range, and you put it in an Excel sheet and have them adjust how many hours they want towards each one. And that really only works for long term relationships or potentially long term development projects or campaign initiatives. So I borrowed a little bit from each one of those. And just so that everyone knows where they came from, there’s Matt Griffin from Bearded Studio is the one that commonly writes about hourly pricing. He has an article and an eBook up I think on A List Apart. Dan Mall from SuperFriendly talks about value-based pricing, and Ben Callahan from Sparkbox is a big proponent of the collaborative pricing. And I know all three of those guys. I talk to them online. And I’ve tried each one of those pricing models. And I believe that each one of them can still work for someone. For me, my mindset in how I approached business development with potential clients … I needed a way to combine each of those. So golden mean pricing … it sets a floor and a ceiling. I want to give people a range to view where their prices could fall. And if you’ve ever quoted a logo project, you’ll think “alright, this logo’s going to take me about 10 hours to do, so I’m just going to multiply by my hourly rate and I’ll give them that as a flat rate quote”. But what happens is that you go a little bit beyond that because there may be a pivot in the middle of the project. So I suggest setting the floor of this golden mean range by calculating what you think your hourly estimate will be for completing a project and then tacking on a 15% contingency amount. What that’ll do is it’ll give you an idea of “if I can’t get this much value from my project, I don’t think I should pursue it any more”. And then the alternative to that, the other extreme is setting the ceiling. And I like using Dan’s value based pricing model for this. See, what’s the pie in the sky project value that you think they’re getting out of this? How successful is the company? How much do they need the project that they’re coming to you for? How much do they value that completed project? And set a price on that. 28:54 Luke So that would be almost like saying, okay, so this client would have … If I do this project for them, I could foreseeably win them 100 extra clients this year, and their average client lifetime value is X. And so therefore, I can figure out that this project is going to be worth $20,000 to them this year. And next year it’ll be worth more. But again, the floor and the ceiling are just guidelines because where we really want to end up is somewhere in the middle. A lot of people would say “okay, well so you’re telling me to just take spot in the middle of those to and use that as my price”. Well that is what I call the natural golden mean, which is just the median, but we all know how projects go. Which is that the sales process has ups and downs in what people think they need and then realize they don’t need, and things like that. So what you can do is you can use … you can sway from the middle of that pricing range, and if you know that they have a higher budget than what the median range is, figure out what extra value you can give them within their budget to make the project more successful. And if you know that your natural mean price is a little higher than their budget, well, did you guys talk about something during the sales process that might been like a little extra perk? Can that come out for something that’s more required in the project? Then you can bring the price down a little bit. And really what you’re doing is … as long as you stay somewhere between that floor and ceiling, and gauge the deliverables and the added services towards what you know their budget range is, you can confidently put together a flat rate quote with the proper deliverables and the proper timelines, and know that when you show them that price, they won’t be startled by it. And at least that’s a jumping off point for dialing in the contract after that. 31:09 Luke You mentioned in gauging off what you believe their budget to be. Do you just come out and ask them what their budget is during the process, or … how do you get to that number? 31:19 TimB Yeah, always ask during the process. The earlier you can, the better. Likely you’ll want to learn about the project first before you just ask them to give you a dollar number. A lot of times, people will just tell you what their budget is. And they may be underselling it to you but that’s okay. When you set the ceiling in golden mean pricing, you’re not basing it on what they said their budget is. You’re basing it on what you think they would ultimately need if they had the perfect project with … not an unlimited budget, but a budget that could accommodate it. 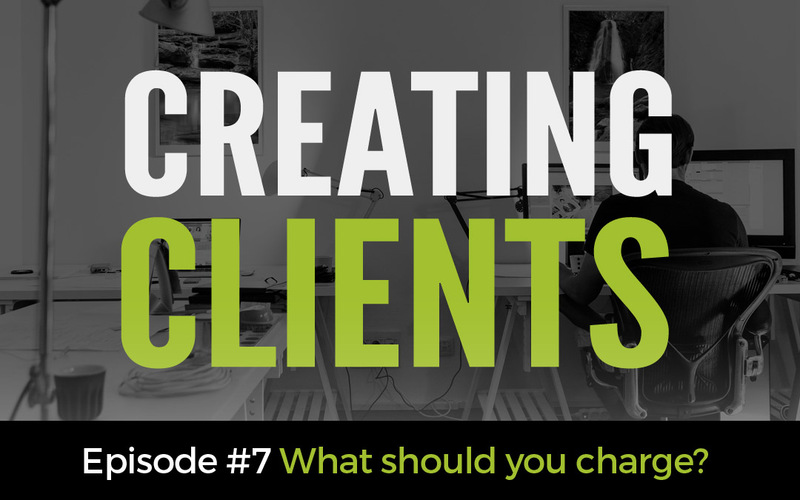 If they don’t give you a budget or they’re hesitant to, there’s a trick that you can do. Let’s say you’re working on a website. And you say “well what’s your budget for this website project?” And they say “we’re not really sure”. And then everyone chuckles, and then you say “oh, so there is a number” because obviously they know that that’s fake. And you try and reign them in that way. “Well, what if it was $10,000?” And then they’ll say “well, we’re thinking more around $6,000.” And now at least you have a starting point to figure out where your range of services should come in. 32:38 Luke Yeah, that is a great trick. I think that that is something anybody can apply. And I love the fact that you add that extra element of making it a ridiculous price first up, because you’re not challenging them. You’re actually giving them something ridiculous but it opens the conversations. I think that’s a great way. 32:57 TimB Yeah, it’s light-hearted. If you say “well, is it $10,000?” they may actually think that you’re already predicting their project will be $10,000. But by going so ridiculously high, you’re breaking the ice so that you can have a more serious conversation in the next minute or two. 33:15 Luke So just as we start heading towards the end of our discussion, what advice would you give someone? I mentioned before a lot of our people that will be listening to this are people who are just getting started in the industry. What advice would you give them about figuring out where their pricing sits in the market based on golden mean pricing? 33:35 TimB That’s a good question because if I’m asking you to figure out your hourly estimate for the floor, you should know where your hourly rate is. Commonly, I’ve had a few questions about this come back to me because people seem confused by the floor aspect of this model. Your hourly rate should be competitive with people on your same skill level in your market. Buffalo, I mentioned, is in a resurgence right now. It’s part of the rust belt. We aren’t New York City. We’re not Atlanta. We’re not Chicago. We don’t have $250 – $300 /hour agency costs. We’re much less than that. So know your market. Know the quality that you present to people. Do you have a portfolio that compares with the person charging X dollars an hour that you know of? If so, then you can charge similarly to that, or maybe even a little higher if you know that your quality is better. If you haven’t quite reached that level yet, you may want to reduce your price — your hourly price — to pick up some steam. Offer more proof of work and then slowly bring your quality and example of work up to where the rest of the people in your competitive pool are. A lot of time will say “well my hourly floor was too high, and I immediately out-priced my client”. Well, did you factor in too many hours and pad it too much? That might just be an estimation issue. How efficient are you? Is your hourly rate too high? So even though it’s a proper amount of hours, you’ve over-priced because you’re over-valuing yourself. So it’s really important to have that hourly price gauged. And knowing a realistic, competitive price, check against people in your own market. 35:51 Luke Yeah. And this is notoriously difficult to do when people are starting out. So I think that’s really good advice. And some of those things I think you’ll agree you can’t really know until you’ve got a bit more experience under your belt. So at the beginning, at least, you’re always going to be taking a bit of a leap of faith. But once you’ve done a couple of projects, it gets easier, right? 35:54 TimB Yep. And if you find that you’re winning every single project, it might be because your price is low enough, and your quality is high enough that it’s time to raise your price. Because you can easily put yourself out of work by having too much work. 36:08 Luke That’s very true. If you have so many jobs coming in and you’re not getting paid right for them, then you’re going to go out of business and that doesn’t serve anybody well. Alright, so just before we finish up today, if someone wants to know more about golden mean pricing, or they want to connect with you, what’s the best way to do that? Where should people go? I talk about business there. I talk about hockey, I talk about soccer. But I do throw business in once in a while. (Luke laughs) So you can always ask me questions there too. 36:57 Luke Alright, well that’s great. Thanks so much for your time. Really appreciate you being on the show. 37:01 TimB No problem. Thanks for having me on.